Julia Li and her husband, Erik Lewis, had a wish list a mile long when it came to renovations on their 1912 Wallingford Craftsman. From the moment the couple moved in five years ago, reworking the top-floor master suite to better accommodate the steeply pitched roof angles and future children topped the list. Last year, they finally decided to tackle the project, enlisting the help of Portland-based interior design firm Casework (casework.it). Founder and creative director Casey Keasler, whose style Li had fallen in love with through a friend’s remodel, describes the original top floor as “pretty dark and drab”—clearly it had been an attic that a previous owner had repurposed as a bedroom (with a deep, useless closet), small bath and office. The space was in desperate need of a makeover. The couple wanted to maximize space and efficiency without adding square footage. “People always talk about form over function, but I’ve always been more for something functional than beautiful,” Li says. A trained architect currently working in marketing, she was clear in her requirements: room for their king-size bed, a double sink in the bathroom and a nursery so that their future children would be able to sleep nearby. To achieve these goals, Keasler and her team leaned into the roof angles, locating the walk-through space in the center of the room, where the ceiling is at its tallest point, and creating custom storage in the low-ceilinged, awkward spaces. 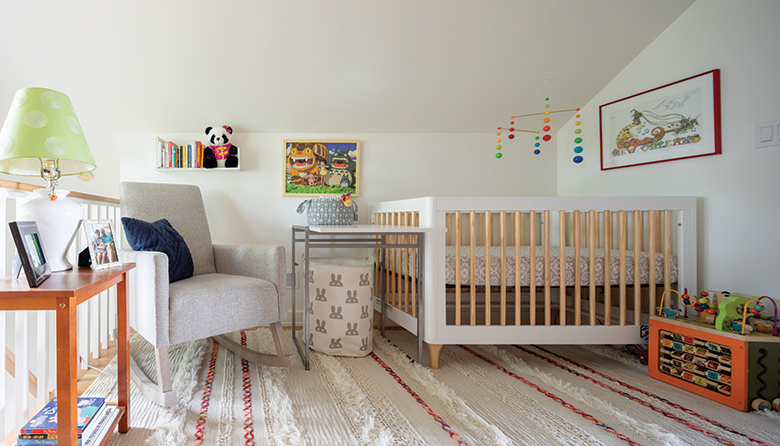 The office became a nursery, and includes a built-in twin-bed nook with drawers that double as steps. The couple now has a 10-month-old son, Lihai, who will sleep in the bed after he’s outgrown his crib, Li says. Built-in oak closets and bookshelves were placed throughout the space, and a sort of dressing room was constructed directly outside the bathroom. Although the design team couldn’t quite fit two sinks into the bathroom, a compromise was reached with a huge trough-like sink with two faucets. And the couple’s king-size bed, though a tight fit, looks perfectly at home next to a window that catches the sunrise.